Imagine this: You spend all weekend (or summer) prepping engaging reading centers. You are excited to introduce them to your students to supplement their independent reading and help them master the skills in new, engaging ways. But, how do you make sure your students actually do the work instead of goofing off? And then those who do the work, how do you make sure they don’t just rush through it? 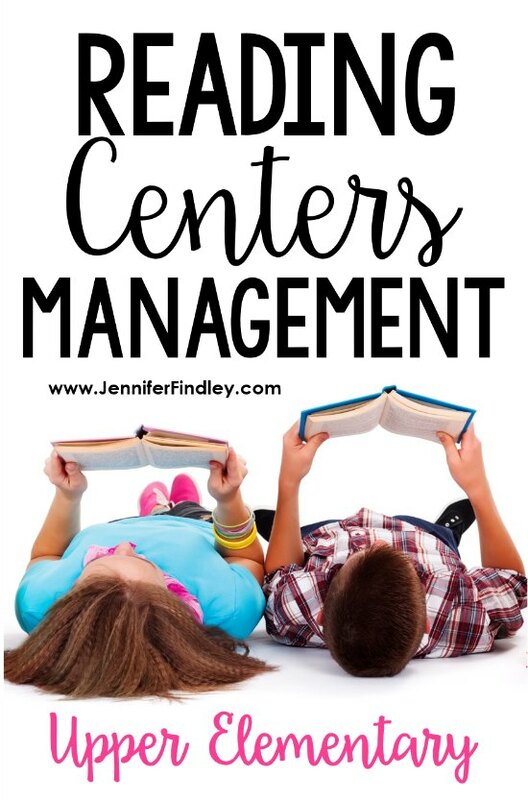 While I don’t have a magic wand to solve both of those very real problems (and many more that may come up), I do have some tried and true tips for reading centers management that have worked for me over the years. Keep reading if you want to ensure your students are working hard during reading centers (and producing work worth actually checking). Do you do mostly independent reading? 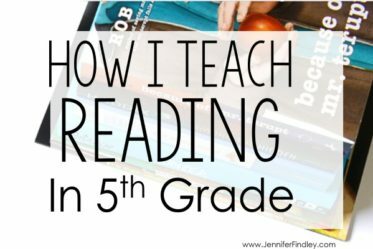 Click here to read my top five ways to keep my readers accountable for independent reading. I spend a good chunk of time at the beginning of the year teaching, modeling, and practicing reading center procedures and expectations. We create anchor charts as reminders and review throughout the year as needed. I also like to number my expectations on the charts. This way if I have to remind the class or a group of students of the procedures, I can quickly say, “Reading Expectations #3, please.” The students then know to refer to the chart and the number I called to fix whatever behavior needs to be addressed. By doing it this way, I am putting the expectation back on the students, I am not nagging, and there really is no back-talking from the students when done this way. I mentioned I do this at the beginning of the year, but I also do this whenever I introduce a new reading center into my classroom. By keeping my reading centers and their directions very consistent, I am able to save so much time going over expectations. I introduce a reading game or center, I teach the expectations, and then I can just change out the content, text, or center from week to week. The students know the format of the center and the game already, so they have no excuse to misbehave or be off-task. The focus of the centers can also be on the content and not learning a new game. Need some ideas for consistent reading centers? Click on the links below to check out my go-to reading centers that follow a consistent format. Poetry Task Cards —- Grab the task cards for FREE in the post linked. Just change out the poems each time you have a new rotation of this center. Want some free reading puzzles, spinners, and game boards? 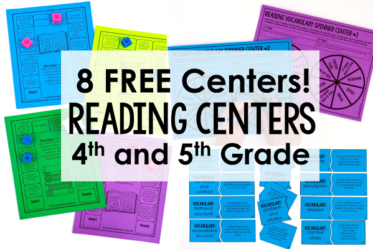 Check out this post to download some free reading games and centers. Sometimes you have students who stay on task but rush through the work. To try and keep this from happening, I create model responses or examples of quality work for my centers that stay consistent. One example of how I model quality expectations is for my Comparing Themes reading center. For this reading center, the students read stories and sort them based on which theme the story teaches. Then, they choose two stories and write a compare and contrast response. The response can be tricky for the students, so I provide an example essay to model my expectations. Click here if you want to see this reading center in my Teachers Pay Teachers store. Don’t make it too difficult, and never make it new. My centers are successful primarily because I make sure I only use review skills in my reading centers. I also try to keep the reading at the majority of my students’ independent reading levels. If I can’t do this (and sometimes I can’t because I have outlier students or skills that really need grade level text), I will scaffold the groups or students who need it. Preread as a small group. I do this a lot with my reading games. We will read and discuss the text as a small group, and then in the center, the students will reread the text and play the game. Use partner reading so the students can support one another. When I do this, I do still try and keep the levels of each student close together. Use short texts in reading centers. I have found that most of my lower level readers can find success with grade level texts in short chunks. My reading puzzles are a perfect example of this because the texts are rigorous but also short enough so most of my below grade level readers can still find success with them. A lot of my reading centers are also naturally scaffolded because the students choose their own independent reading books. Click here to grab free reading game boards that the students use with their independent books. Put the responsibility back on the students. One of the best ways to ensure accountability and on-task behavior is to move the responsibility back to the students to hold themselves accountable for the quantity and quality of their work. Quality checklist of what needs to be included in responses. One example of how I do this is through my reader’s response checklists. You can read more about my reader’s response checklists by clicking here. Need some reading center checklists for students? 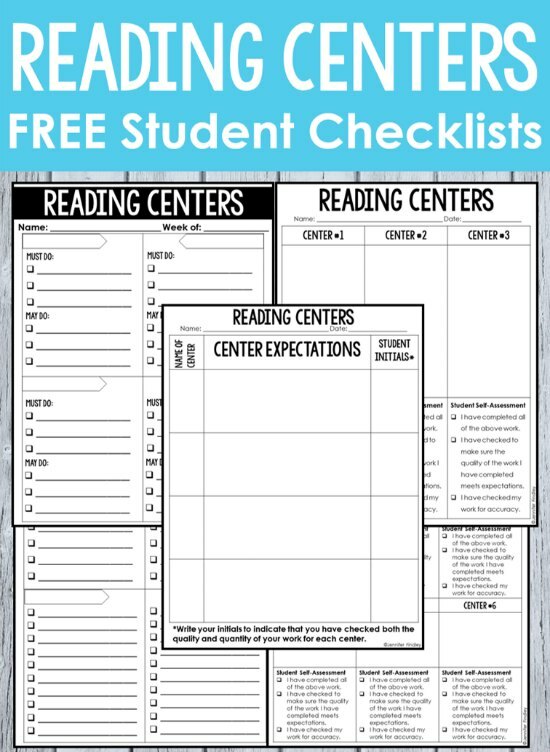 Click here to grab some FREE editable student checklists for reading centers. Don’t want to deal with editable versions? Click here to grab the PDF version. Embed privileges in your reading centers. Another simple way to improve your reading centers management is to embed privileges in the work itself. For example, partner reading and reading games are centers that my students love and don’t want to lose. They know that if they do not complete their work at a high quality or that if they misbehave, they will lose those privileges. And trust me, it rarely happens and has never happened twice. Making the work engaging makes them want to keep the privilege of doing them. Make quantity expectations as clear as quality expectations when applicable. For example, I actually tell my students (and record it on the board) how many reading puzzles I expect them to match up when they are at the puzzle reading center. When they know exactly what is expected of them, it helps. Have logical consequences for not completing the work. I have only had to do this a couple of times, but I usually just have a stack of worksheets copied for them to do at their desk in lieu of reading centers. Another option is to take away the “fun” reading centers or require the students to work independently at their seats instead of moving along with their group. Hopefully these tips will help you maximize your reading center time and keep your students on task and working. How do you keep your students accountable during reading centers? Share your reading centers management ideas and tips in the comments. Then, click on any of the links below to read more articles about reading centers for upper elementary. Hello, hope all is well. Thanks so much for all that you share. However, just wanted to know if you had any advice. At our school the teachers teach subject based classes. I teach K-4 Reading (each class 4blocks 60 minutes) I find it hard to teach skill , centers, guided reading, and passages… HELP!! When your students are at centers do you have mix ability groups or are they the same groups as your reading groups? My struggle is if I pull them out of a center to come to my reading group and I want to use it for a daily grade then I struggle to find time for them to make up the one they missed. If keep the groups the same as my reading groups then my lower groups may struggle at the center.